I've been learning the second movement of Mozart's Piano Sonata 16 for a while. While I get most of the stuff memorized, some part of it just doesn't sound right comparing to recordings on YouTube when I play it. 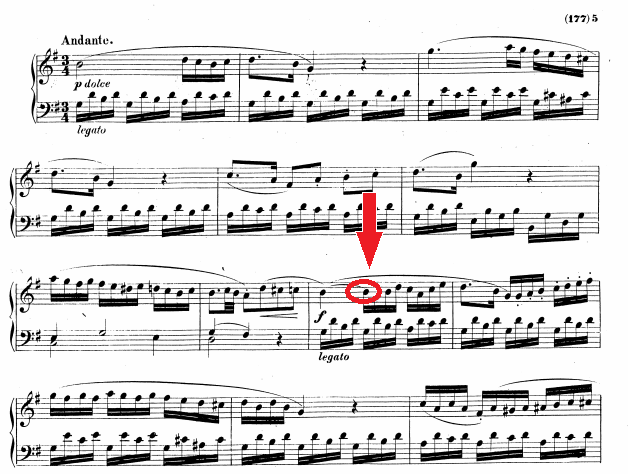 For example, this note at the 9th measure as indicated in the image sounds like it note is skipped in recordings. Is it there only because the slur needed something to land on? There are several re-occurrence of this thing throughout the second movement. When two notes of the same pitch are tied together, they are played as one whose duration is the sum of both. You'll often see notes tied across bars where it's otherwise impossible to show that they should be played as one, and in this case it's also otherwise impossible to show that you should hold the B for one and a quarter beats (it's a 5/16ths note). With that said, ties are often sometimes used as Reina says, to indicate the timing and phrasing. There's no reason a dotted quarter couldn't be written as a quarter tied to an eighth or an eighth tied to a quarter, for example, though this is rarer (especially the latter). You are hearing it correctly in the recordings; the note you have pointed out is not re-articulated because of the slur. The music is written as it is because of the time signature. In 3/4 time, there are always three quarter-notes per measure. Furthermore, in order to aid the reader, the measure is rhythmically broken into three whenever possible. In the instance you've cited, the second B-natural is necessary because 1) it fulfills the requirement of having three quarter-notes per measure, and 2) because it shows to performer, visually, where each of these three beats lie. In general, when a note of a given pitch is slurred to another note of the same pitch, the note is not re-articulated. Not the answer you're looking for? Browse other questions tagged piano sheet-music notation or ask your own question. Do you have to enjoy a lot of music to make the investment of learning the piano worth it? Why is this C played as an A flat?